Blondino doesn’t like limitations, they’re not aiming to please. Yet the first EP by the Paris-based duo (Tiphaine Lozupone & Jean-Christophe Ortega) is a very pleasurable affair. First track Mon amie is a twangy, brass and strings-infected ballad with a movie end-credits vibe. Think Lana del Rey, produced by Calexico. Tiphaine has the same ice-blue vocal chords like Lana, but with more Birkinesque huskyness. Next song Oslo steps into La Grande Sophie-territory, a fierce scorcher of a song. But the cherry on the cake is the electronically charged Tant qu’il y aura des hommes. The gothic Hotel Morphée’s a reference, Goldfrapp and Bashung too. Different tracks, different moods, but that’s intentional. Blondino’s named after a novel by Sture Dahlström, they’re influenced by books, movies, musical spectacles and the aforementioned bands. Taken from their forthcoming debut album, here are two new tracks mixing Moodoïd’s signature psychedelic pop sound with hints of glam rock and world music and then some. Featuring Melody’s Echo Chamber, Didier Malherbe (from cult band Gong) and Riff Cohen. Yep, it’s that time again. To round up the best summer tunes from France and Quebec, for the fifth annual Parfait Eté-playlist. This time, I selected 20 synthified songs, because in the last few months, the musical legacy of Elli & Jacno, Lio and Niagara popped up in tracks by new artists like Theremynt, Clea Vincent, DyE and LoVe on the Beat. It’s danceable, it’s upbeat, it’s breezy. And Daniel Chenevez, half of Niagara, is on there. As are some non-French singing, yet very French artists. Have a great summer. Go to Spotify HERE. Cover designed by Wilbert Leering. And speaking of Lio, guess who released a new (rocking) single today? Mark Sullivan reports on the Swiss song festival. Every two years the Swiss town of Pully, a suburb of Lausanne on the shore of Lake Geneva, holds a song festival of francophone music from North America. It is the initiative of a local politician, Rico Perriard, who began it in 1996. It now includes other villages on the famous wine-growing slopes of the Lavaux. Both Catherine and Salomé appeared solo. 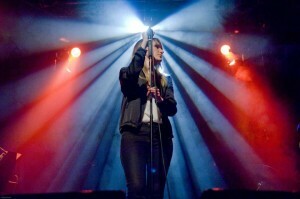 Catherine Major appeared on 11 June in a large sports hall, on a high stage more suited for a rock or country-folk band. She began with some beautiful piano-playing, and then a number of her well-known songs including ‘Saturne sans anneaux’, ‘Valser en mi bémol’ and ‘Amadeus’. She sang ‘La voix humaine’ standing on the edge of the stage, a-capella, and finished with ‘Le piano ivre’. The conditions were not right for a fine performance. A singer at the piano on a high stage is not easy to see well, and the lighting was disappointing. The least good feature was that the speakers for her voice were to the sides, so that piano and voice came from different directions. One hopes that next time she will be able to appear in the main Pully theatre, the Thèâtre Octagone, in a well so that the audience looks down on her, and play with good acoustics. Nevertheless, it was good to see Catherine live. See her in full flow with a band and string accompaniment at Festivoix, Trois-Rivières in July 2012 here with ‘Saturne sans Anneaux’. 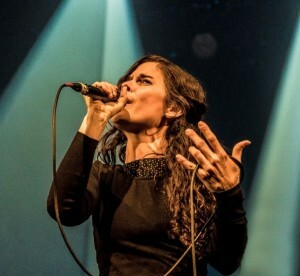 Salomé Leclerc played on 13 June in a tiny theatre, the Thèâtre de la Voirie, with just 60 places, and the audience was very close to her indeed. My photos understate how stunning she is. Tall and slim, at 27 she is the perfect representative of the ‘folk alternative’ side of Quebec music. 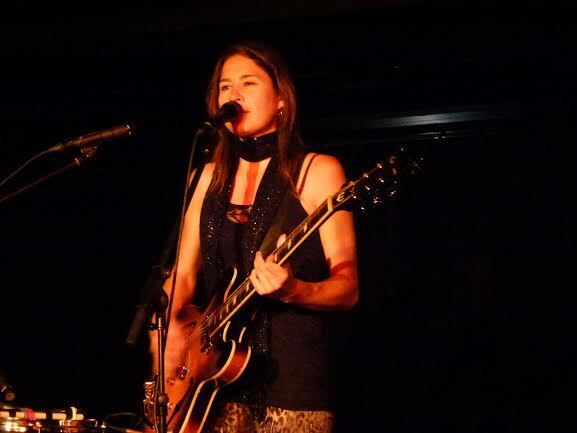 With her long training in percussion, she can create a fine sound solo from just a guitar – acoustic or electric – and a set of drums. There cannot be anyone else who can do so much by herself in live performance. ‘Ne reviens pas’, ‘Love, naive, love’ and the rarely-heard ‘Volcan’. From her forthcoming second album she gave us ‘Arlon’ and ‘Vers le Sud’ and two new as yet unavailable tracks. She was regretful that there was not time in her set to sing some of her best-known tracks – ‘Tourne encore’, ‘Sous les arbres’, ‘Caméléon’. Worth hearing was ‘Garde-moi collée’, most memorably sung live in 2012 on TV5 Monde. It was a surprise talking to Salomé afterwards, as when she speaks English she sounds European – Swiss even – and not Canadian. Her whole style – appearance and performance – seems suited for this side of the Atlantic. So we must hope that she will be back soon. 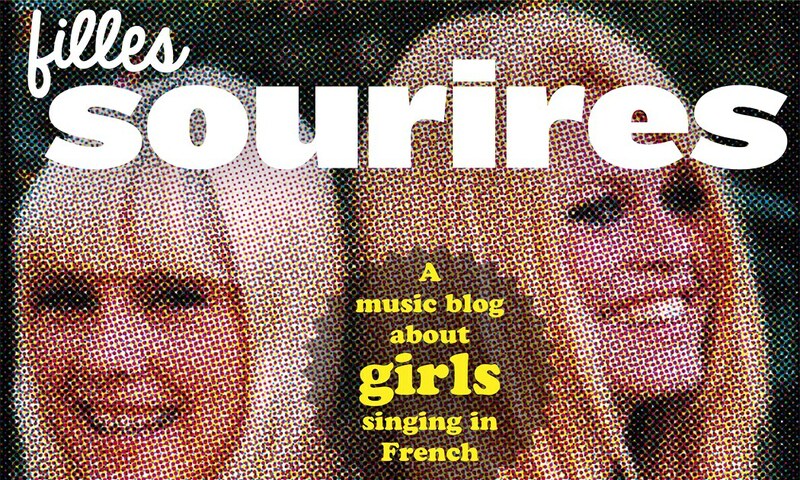 The good news for Filles Sourires is that Salomé told me ‘I know Filles Sourires’ and that she has read the May 2014 post about her! Once her second album ‘ 27 fois l’aurore’ is out this September, will Salomé return to Europe ? If she reads this post, I hope she decides on another visit, with her band. She made a film in Amsterdam, but never performed. But yesterday, Vanessa Chantal Paradis conquered the Amsterdam Paradiso. As we knew she would. 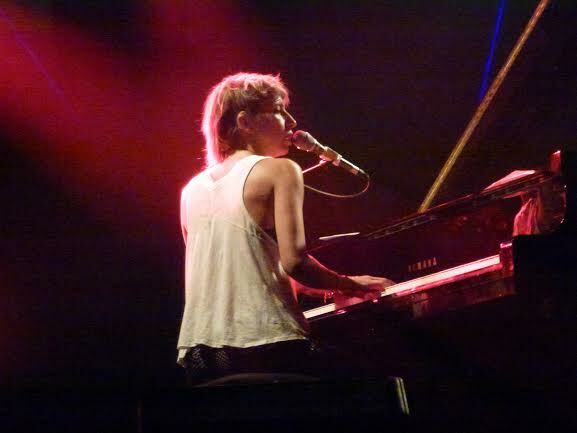 With 20 or so strong songs under her belt, with a stellar band (including Benjamin Biolay on keys, slide trombone, guitar and violin, plus Dutch producer/pianist Reyn Ouwehand) and her magnetic presence, VP gave a show that ranks among the strongest French performances I ever saw. Vanessa doesn’t need fireworks or costume-changes, a simple video-wall and her red leather pants and red-and-black top were quite sufficient. And of course, her voice. Now, VP is no Aretha. But, as her live albums proved before, she can really sing. Confident in L’incendie (one the few songs she played from the masterpiece that is Divinidylle), sensual in La chanson des vieux cons (Paradiso fell silent, bar one heckler), flirty in Sunday Mondays. The dub-reggae vibe of New Year was followed by an irey version of Joe le Taxi, ‘a song that is very special to me’, she said. One of the few ad-libs, but she did make contact with the audience (that consisted of ex-pats, 40-somethings, gays, even a father with his young daughter); high-fiving, smiling, making us sing along. The encore ended with a festive version of one of my favourite Love Songs-tracks, the African-influenced Tu vois c’que je vois. Merci, she said, when it was over. ‘Lekker!’, Biolay tweeted, Dutch-style. Paradis in Paradiso, ‘t was paradise. See pictures of the show here. Dutch newspaper review here. Nicolas Michaux, singer of the band Eté 67 (you might remember that band from the Musique Fantastique compilation) made a solo single. The video is funny and clever. Go to Bandcamp. This blog’s been following Heloise since 2012, I even got a small piece on the Guardian’s Music Blog. I was very curious about Chaleur Humaine; it’s one of the strongest French albums released this year, one that can hold it’s ground against the influx of brilliant Quebecoise artists. Though the ‘& the Queens’ adjective suggests a band, C&tQ is a one woman operation, which makes this album even more impressive. She admires Katy Perry, Michael Jackson and Beyoncé, but her music’s more in the vein of Fever Ray and Grimes: moody, electronica-driven, fragile at times. The title track is one of the best tracks, with strings ‘n beats and a vocal melody that’s in the vein of Bashung and Christophe: no wonder, she covers his ‘Paradis Perdus’. Christine even inserts a bit of Kanye in her own version. Earlier, C&tQ did a reprise of Yves Simon’s Amazoniaque. Now Julie Blanche’s eponymous debut EP was one that was missed when it was released last year. But with Julie finishing runner-up in this year’s edition of the prestigious Francouvertes (and you may just have heard of some of the previous finalists – La Patère Rose, Émilie Proulx, Chloé Lacasse, Les sœurs Boulay, not to mention last year’s winners Les Hay Babies) what better excuse than a quick revisit to one that got away? Fanny Bloom (she of La Patere Rose, she of the synthetically great Apprentie Guerriere solo debut) likes to change her style. Her new single (album’s coming up after summer) is a brass heavy, twerkin’ pool party. What do you think?